Clinical Laboratory Services Market size is set to exceed USD 342 billion by 2024; according to a new research report by Global Market Insights. Rising emphasis on preventive medicine and technological advancements in laboratory robots will augment clinical laboratory services market growth. Advancements in molecular diagnostics, availability of fully automated tools such as immunostainer platforms and DNA extractors should foster market growth. Moreover, advantages provided by automations include handling of specimen movement, reduces cost and time for generating results that encourages customer buying behavior and will upsurge clinical laboratory services revenue size over the coming years. Rising burden of target diseases further fosters business growth. Growing initiatives by organizations to control these target diseases and reduce the burden of target diseases should impact positively on clinical laboratory services industry growth. For instance, Population Services International (PSI) incentivizes staff members to mark health conditions with utmost burden. PSI added goal to target around 42% of the burden of disease, being measured as Global Burden of Disease (GBD) thereby, will boost market growth over the coming years. Falling reimbursement rates below the cost of performing test; results in unsustainable environment for labs that will hinder business growth. Additionally, involvement of various authorities for regulating clinical laboratory services will hinder market growth during the forthcoming period. Medical microbiology & cytology test type segment will grow at 7.7% during the forecast timeline due to increasing use of these tests for research purpose coupled with surging number of infectious diseases. Moreover, high demand of microbiology testing to diagnose microbial diseases should boost segmental growth over the coming years. 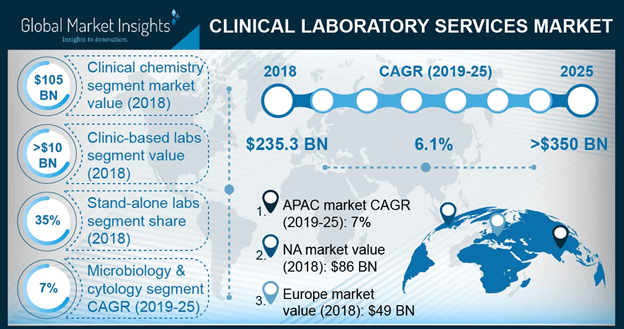 Clinic-based laboratories of service provider segment held USD 10.8 billion revenue in 2017 as a result of rising demand for early disease diagnosis coupled with high adoption rate of routine chemistry tests performed in clinic-based labs. U.S. clinical laboratory services market held USD 72.9 billion revenue of North America in 2017, owing to escalating prevalence of target diseases that includes cardiovascular, diabetes and blood disorders. UK clinical laboratory services market accounted for 18.6% revenue share of Europe in 2017. Growing elderly population along with availability of advanced testing solutions will drive business growth in the country. As per Government Office for Science estimation by 2040, around one in seven individuals is anticipated to be above age 75. This will inhibit business growth in forthcoming years.